Rafa Benitez has warned his Newcastle United players that he plans to cull his squad ahead of the new Premier League campaign, writes Miles Starforth. Benitez wants a clearout to generate funds, cut the wage bill and free up space for more new signings. United’s manager – who last week sold Daryl Murphy to Nottingham Forest – will need to name a 25-man squad for the coming Premier League campaign. And number of players will have to leave, either on loan or permanently, between now and the end of next month when the transfer window closes. Siem de Jong, Grant Hanley, Karl Darlow, Jack Colback, Emmanuel Riviere, Achraf Lazaar and Tim Krul could all follow Murphy out of the door this summer. 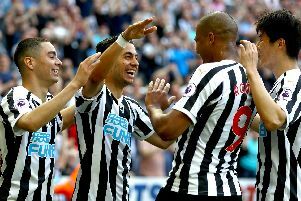 However, Benitez says he’ll first give his fringe players the chance to impress, though Krul and Riviere are yet to feature in pre-season. De Jong – who has three years left on his contract – is playing for his future in pre-season. The forward started Saturday’s 1-1 draw against Preston North End at Deepdale. “I think in the first game (against Heart of Midlothian), he played quite well, but the team was not helping too much (against Preston),” said Benitez. “I think he’s OK, because when he is on the ball he is fine. He’s a good technical player. “But, physically, we were not at the level we were expecting, and also we were not playing at the tempo we were expecting. “I think for all of them and for us it is important to give them the chance to impress, to see if they can do it. New signings Jacob Murphy and Javier Manquillo made their debuts after their respective moves from Norwich City and Atletico Madrid last week. “With Jacob Murphy, we were looking for some wingers with some pace, and he can give us that,” Benitez said. “With Javier Manquillo, he can play both (full-back) positions, and we needed to cover a little at right-full-back. “He has to improve obviously from the last season (on loan at Sunderland), but he’s a player with potential, so if he can train with us these days and understand what we are looking for he can be a good addition.